Staff photo by Erin O. Smith / Cody Beals holds the finish line banner above his head after he finishes Ironman Chattanooga Sunday, September 30, 2018 in Chattanooga, Tennessee. Beals has competed in two Ironman events and has placed first in both. Cody Beals remains undefeated in his short Ironman career. 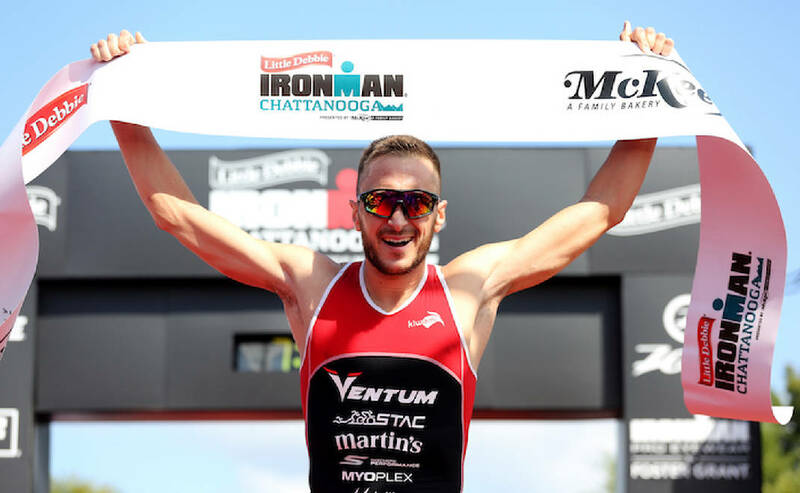 The Canadian triathlete has won both Ironman competitions he's entered after racing to first place in the swimless 2018 Ironman Chattanooga. The win comes on the heels of a victory in his first ever Ironman last month at Ironman Mont-Tremblant in his home country. During that race, he set the overall course record and bike record. "I like short distances more, but it's hard to argue with my results over the longer courses," he said. The 28-year-old professional historically raced Olympic distance triathlons and Ironman 70.3 races — which are half the distance of the full Ironman. However, he's quickly finding his strength is the full Ironman. Beals is quick to admit the swim is his weakest discipline — although, he was second out of the water behind swim specialist Antoine Jolicoeur Desroches in last month's race. Sunday's race was well-suited for his skill set, he said. Torrential rains earlier in the week led race officials to cancel the swim. "Like everyone else, I was disappointed. I signed up for a full Ironman," Beals said. "But the organizers did a fantastic job scrambling to pull off an event. They could have easily canceled it, and I know a lot of work went into still giving us a race." American and Ironman Chattanooga staple Matt Russell ran down podium finisher Kirill Kotsegarov in the final meters to place second despite a restroom break at the tail end of the marathon. Russell has competed in both Ironman 70.3 Chattanooga and Ironman Chattanooga on multiple occasions — having won the 70.3 race in 2017. He is one of the few world championship-qualifying racers competing in the weeks leading up to the Kona, Hawaii event. The Florida resident was nearly killed during last year's world championship after colliding with a van that pulled onto the course. Russell suffered lacerations to his neck and a severe concussion. "Obviously going to Kona, there's going to be lots of emotions," he said. "There's a couple ways to think about it. You can think negatively about it or try to think positively, and I've been trying to make it into a positive." Russell prefers to think about the previous world championships in 2016, where he "brought back a souvenir," he said, as he and his wife conceived their first child on the trip. For many of the participants who had spent months, and in some cases years, training for the race, it was undoubtedly a disappointment. Last week's heavy storms caused major flooding in the area and left some of the run course underwater. Some racers didn't bother to come, canceling their hotel reservations in the days leading up to the race. The Tennessee River was high, with debris and bacteria threatening swimmers. Race officials ultimately canceled the swim and diverted several hundred yards of the run. "The general feedback from the athletes was obviously disappointment,' Ironman senior regional director Keats McGonigal said. "But they seemed to understand. They look out here and see trees floating past where they were supposed to be swimming, and they understand the decision that we made. Now, they're in the middle of racing, and we're still having a good day."